Canadian whiskey has never been something I’ve spent much time seeking out. With a reputation for mild flavors, often the result of blending rye whiskey with largely flavorless grain whiskey, I’ve found it’s a bit lacking in the distinctive character I identify with with my favorite scotch and American whiskey. Fortunately, Canadian whiskey makers have started to see the potential for selling more expressive offerings, many of which are in the same class as good Kentucky or Indiana straight rye. Three stealth Canadian ryes (they don’t play up their Canadian roots) are WhistlePig, Masterson’s, and Jefferson’s, each of which are 10 years old. Each sports a 100% rye mashbill. This is achieved by using the same unmalted rye that goes into all straight American rye, along with a percentage of malted rye, which is necessary for the distillation process. The 86-proof Lot 40 is similarly a 100% rye (90% unmalted, 10% malted), although it doesn’t obscure the fact that this is Canadian rye. The brand was originally launched in the late 1990s but disappeared for a while until it was reintroduced a few years ago. For a time it was hard to find in the U.S., but in the past year it has become more widely available. I was able to find a bottle at a Virginia state liquor store for just under $50. The spirit features a bronze color and a lively nose with fresh bread, banana, anise, and maple. On the palate it has a syrupy intensity with oak, baking spices, fruit cake, and a little floral spice. The finish is subtle with more bread and muted fruit notes. 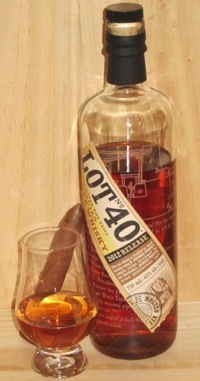 The result is a complex, sophisticated Canadian rye that calls for a similarly complex, yet balanced, cigar. I’d recommend the following: Davidoff Colorado Claro, Illusione Epernay, or Paul Garmirian Gourmet. I realize, for many bourbon drinkers, a Canadian whiskey is something your grandfather drinks or you mix with cola, not a spirit to be enjoyed neat. But this is a fine whiskey that rye fans should certainly pick up and try.